For such a small, sleepy island, there’s a wide variety of things to do in Isla Mujeres – and island located off the coast of Cancun in Mexico. 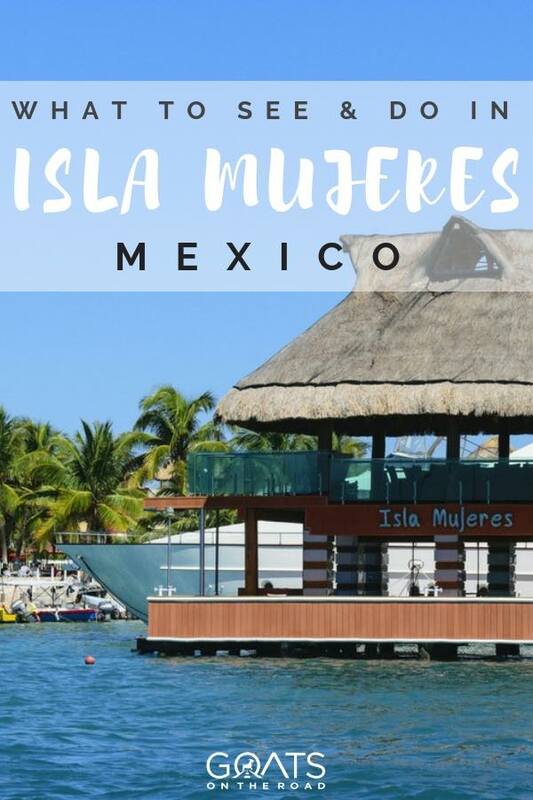 Translated from Spanish, Isla Mujeres means the ‘Island of Women’ and it was named after the Mayan Goddess Ixchel, the Goddess of fertility and happiness. There are numerous incredible places to visit in Mexico, but make sure you add Isla Mujeres to the list! A quick, 20-minute ferry ride from Cancun will whisk you away to an island paradise of warm turquoise waters, swaying palm trees and white silky sand beaches. Isla Mujeres is perfect for a day trip but we recommend staying longer, especially if you want to escape the party scene and all of the crazy things to do in Cancun. This is the place to come to enjoy a relaxing island break. 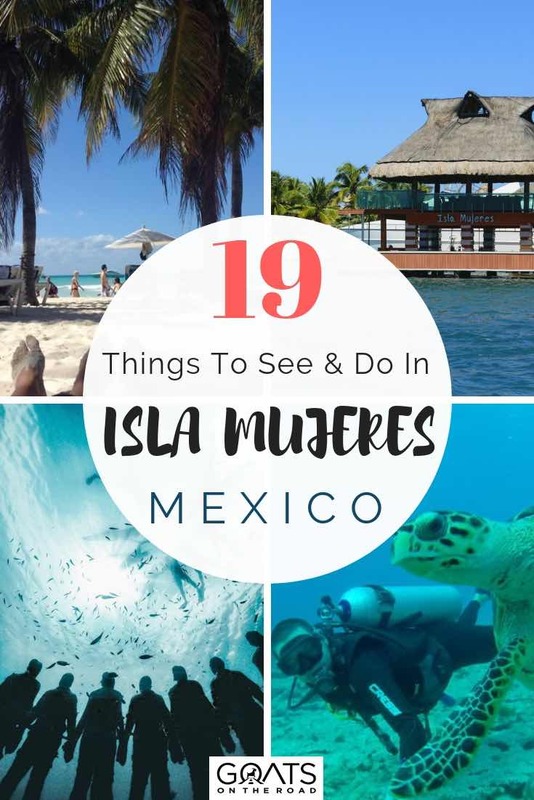 In this post, I’ll list the top 19 things to do in Isla Mujeres you don’t want to miss. A 10-minute walk from the Ferry Pier is the popular family beach of Playa Norte or North Beach. 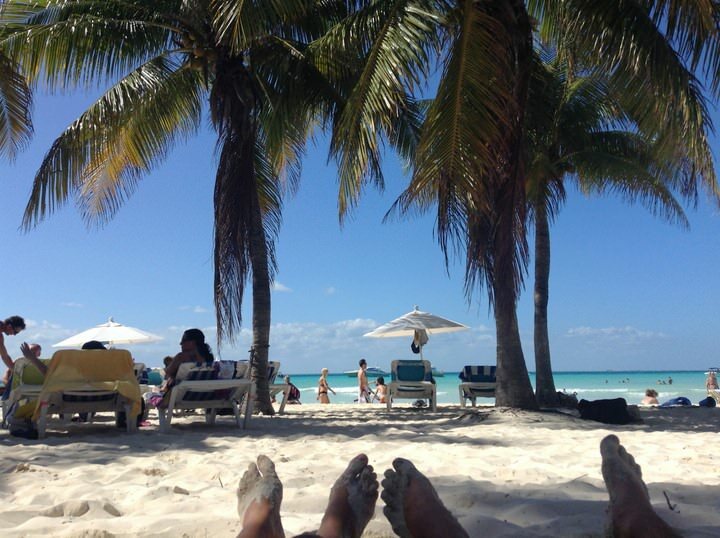 This is the main beach on Isla Mujeres and has been named one of the best beaches in the Caribbean! The water here is calm, and shallow, making it a great spot for families or for just a chilled out day of floating around. Punta Sur is located on the southern tip of Isla Mujeres. Here you can visit the Pre-Colombian Mayan Ruins of Ixchel, or simply admire the stunning views. Garrafon Reef Park is also located here and is home to the Sculpture Garden. In 2001 the Sebastian Foundation and 23 famous artists from Mexico and around the world created sculptures to represent the Mayan civilisation. There are different packages available for Garrafon Park click here for further information. These packages also include activities such as zip-lining, snorkelling and kayaking. ☞ See Also: Things To Do in Playa del Carmen – a list of the top 21 fun things you don’t want to miss! 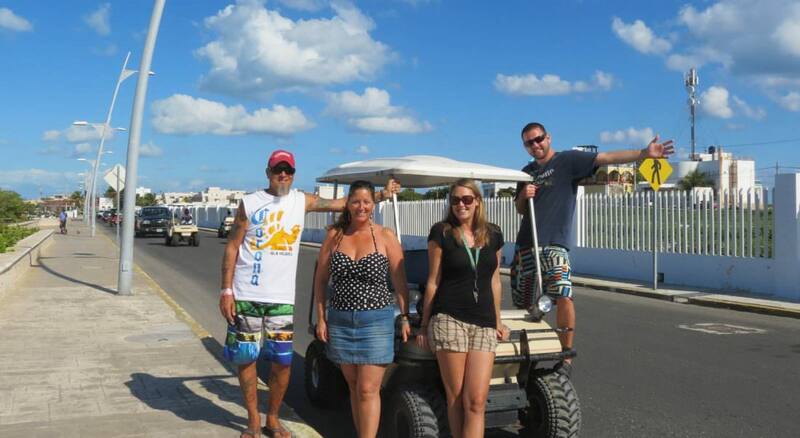 To be able to experience all the things to do in Isla Mujeres we recommend that you rent a golf cart for the day. This is completely normal and is a popular thing to do. There are many golf car rental agencies available around the ferry port and you can expect to pay $45 – 55USD per day for a 2 seater. If you wish to hire a golf buggy for a week you can expect to pay anywhere between $270 -375. The longer the rental, the cheaper the rate will be. You will need a valid driver’s licence in order to rent a golf cart. And, if you’re into golfing, and not just riding golf carts, make sure to head to the town of San Pancho on the west coast. Golfing is one of the top things to do in San Pancho, the course there is well kept and very nice! The Treehouse overlooks Playa Norte and it is a paradise for yoga lovers. Take an early morning sunrise yoga class or an evening sunset class. If you’re looking to get some exercise, practicing yoga is one of the top things to do in Isla Mujeres. Prices start at $20 for 90 minutes and there are classes to suit all levels. For the latest timings for classes check out their Facebook page. As responsible travellers, we’re all for the preservation of our world’s ocean and we were delighted to see the ‘Sea Wall Murals’ of Isla Mujeres. These murals were created by various top street artists from around the world to raise awareness of marine species threatened by extinction in the Yucatan Peninsula of Mexico. ☞ See Also: Things To Do in Puerto Vallarta – a list of the Top 20 things you don’t want to miss! Isla Contoy is located 30 km north of Isla Mujeres. This natural wildlife reserve and bird sanctuary is 9 km long and 20 metres wide and was declared a National Park in 1998. Isla Contoy is one of the most important areas in Mexico for nesting sea birds and sea turtles. There is a maximum of 200 tourists allowed to visit on a daily basis. A day tour starts from $75 per person click here for more information. One of the most popular activities in Isla Mujeres is to visit MUSA, (Museo Subacuático de Arte). You can tour the underwater museum by glass bottom boat to enjoy over 500 sculptures by the creator Jason deCaires Taylor. For a better experience, and to get closer to the sculptures, head on a snorkelling tour or go scuba diving. MUSA was created to encourage visitors to visit an alternative area around Isla Mujeres taking the pressure off the nearby reef. Underwater sculpture parks are created as tourist attractions, but they are also used as artificial reefs to help promote the growth of coral and the return of more marine life. A visit to underwater sculptures (by the same artist) is also one of the top things to do in Grenada, and the Bahamas. The turquoise blue waters off Isla Mujeres are perfect for deep-sea fishing, inshore fishing and spear fishing. The best months for sailfish and marlin are from mid-December through to July. If you enjoy tuna fishing the best months are between April and August. Depending on what type of fishing you enjoy the most, there are many charter operators that will cater for your needs, ranging from charter boats to private yacht tours. Another popular water activity in Isla Mujeres is to swim with Whale Sharks (it’s also one of the top things to do in Cabo San Lucas). During the summer months of June to September you can see this beautiful creatures. Whale Sharks can reach a length of 14 metres and they are really just gentle giants weighing in at around 15 tonnes. Official regulating bodies have put a cap on tours at around $125 per person. The tour includes swimming with the whale sharks, breakfast, lunch, soft drinks, snorkel equipment and usually some time to snorkel the reefs. It is illegal to touch the sharks and you must keep a distance of 2 metres. It’s important that you do your research and go with a reputable, eco-conscious tour company that regulates and respects the rules. Located on Sac Bajo is La Tortuga Granja, the hatching ground for the sea turtles on Isla Mujeres. From May to September these grand creatures lay their eggs in the soft sand where volunteers assist in gathering the eggs and placing them in pens to keep them safe from predators. From August to October, you can witness the local children and tourists releasing the turtles into the ocean. As with the whale sharks, it is recommended that you don’t touch the sea turtles. Entrance fee is $3.00 per person. 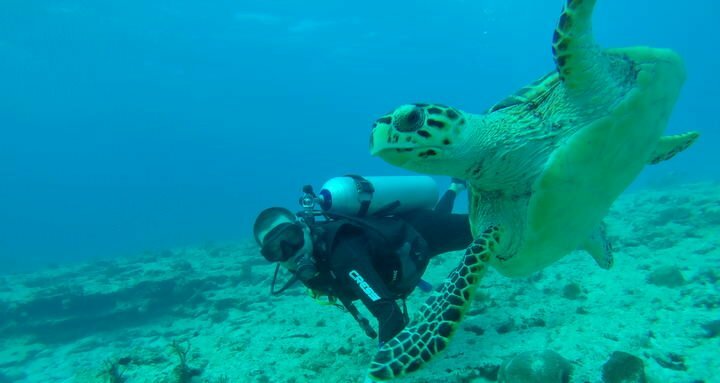 Isla Mujeres has some of the best scuba diving in the Caribbean. Here you can enjoy some incredible caves, and an abundance of sealife – eels, groupers, snappers, turtles, parrotfish and numerous corals. A unique experience is diving at the Cave of the Sleeping Sharks where on the bottom of the ocean a large group of reef, bull, and nurse sharks can be seen sleeping. At a depth of 20-30 meters, this dive site is recommended for advanced divers. Other popular sites include the Machones Reef (800m in length), Tavos Reef, Media Luna, Punta Sur and the site of the Navy Boat Shipwreck (at a depth of 21m). Check out Squalo Adventures for scuba diving trips. An island made from plastic bottles! What a great way to utilize some of the excessive amounts of plastic on the island. If you plan to visit, make sure the creator Richard Sowa is in residence. He will come and collect you by small boat and charges 50 pesos ($2.50) per person to take you back to his island made from over 150,000 bottles. Richard explains how he gathers plastic bottles from Isla Mujeres and creates a platform from them by placing them into bags. On top of the bags, he places wooden pallets, adding plywood, carpet, sand and dirt, rocks and then plants mangroves that assists in binding it all together. A visit here is one of the most unique things to do in Isla Mujeres. If you are a beginner and haven’t done much snorkelling in the past, the best place to snorkel is El Farito. El Farito, to the north of the island, is shallow and perfect for beginners to see schools of colourful fish. Los Machones is more suited to advance snorkellers with a depth of 35 – 40 feet. Other amazing snorkel sites include MUSA , Garrafon Natural Reef Park and Isla Contoy. For more snorkelling and diving, don’t miss Mexico’s most popular island and all of the incredible things to do in Cozumel! In 2001 SECTUR (Mexican Board of Tourism) put together a Pueblo Magico program to recognise Mexican towns that have a special appeal or magic about them in 3 categories. Isla Mujeres now shares the title with over 80 other towns and cities throughout Mexico. Isla Mujeres has a special charm to it, making it a place you will want to return to again and again. It shares the limelight with the charming cobblestoned village of Tepoztlan and its magical pyramid, San Miguel de Allende, San Cristobal de las Casas, Tulum and Taxco, to name a few. A visit to Mercado Municipal in Centro is a must on your list of things to do in Isla Mujeres. Not only can you soak up the local atmosphere, but the authentic food is cheap and very delicious. 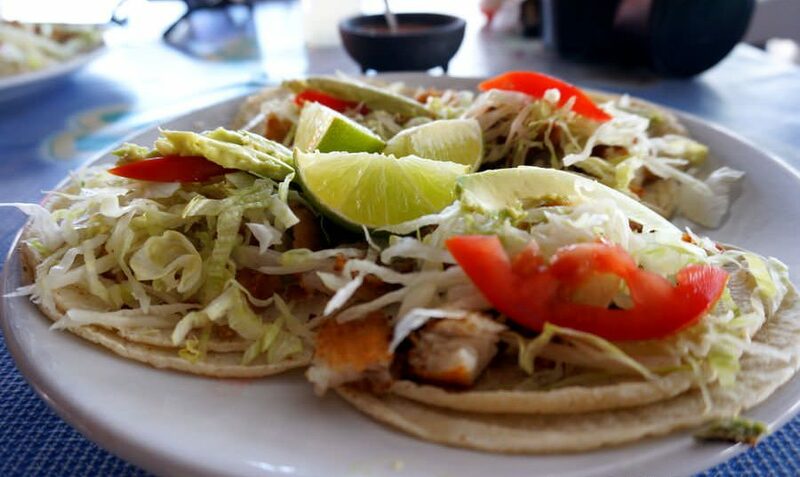 For as little as a few dollars, you can enjoy the best fish tacos and empanadas on the island. It does close early afternoon so time your visit for lunchtime. Every Mexican town has a central square called a Zocalo (it’s one of the best things to do in Mexico City as well). I recommend visiting the Zocalo on Isla Mujeres in the evening, as you’ll find food vendors selling tasty local Mexican street food. Plus, there’s music, entertainment and dancing. Isla Mujeres Artist Fair – On the first Thursday of every month between November and April the fair takes place in the Zocalo between 4 pm and 9 pm. There are works of art, jewellery, clothing and book stalls with a selection of local food vendors offering Mexican cuisine. A perfect way to end the day is to enjoy a cocktail or two whilst sailing at sunset around Isla Mujeres. A 3 hour boat tour includes beer, wine and snacks and starts from $85.00 per person. For more information click here. Cafe Mango at Playa Obispo for local Mexican cuisine. A great breakfast cafe. If you’re backpacking Mexico on a budget, you’ll definitely want to check out the Mercado Municipal for cheap eats. Ready to enjoy all of the things to do in Isla Mujeres?! Isla Mujeres is a perfect vacation destination for families, couples, solo travellers and backpackers. It’s one of those destinations that draws you back year after year and has so much to offer travellers. Who couldn’t love its warm azure waters, perfect temperatures all year round, fun activities and the stunning sunrises and sunsets? 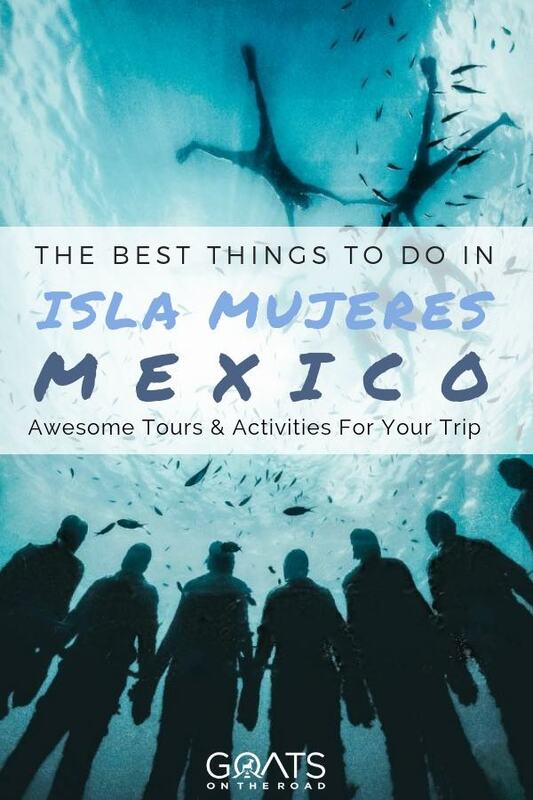 Hopefully this list gave you some great ideas for things to do in Isla Mujeres on your next holiday. Have you visited Isla Mujeres? Add another activity or two in the comments below! Jane & her husband Duncan are Australian Baby Boomers who travel the world continuously. In 2013 they founded their travel lifestyle website To Travel Too. Jane has over 40 years experience in the travel industry and Duncan is the sales and marketing guru of the team. To Travel Too inspires other Baby Boomers to travel and provides first- hand advice on downsizing, closing the nest, travel planning tips and advice.